Treats is made from a fuzzy black material with a white face and hands. He has large sparkly green and black button eyes and a black nose and mouth. He holds a large orange pumpkin in his hands. We’ll get some candy that we can eat! Treats was introduced on 1st July 2015. His birthday is on 1st August. 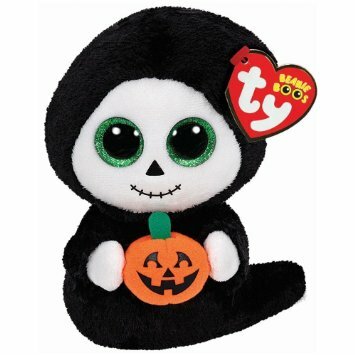 Treats is a Halloween themed Beanie Boo.